Cape Peron, Shark Bay World Heritage Area. Discover the most sublime places in Australia to witness where the ruggedly colourful outback (and bush) collide with our azure sea. Enjoy. 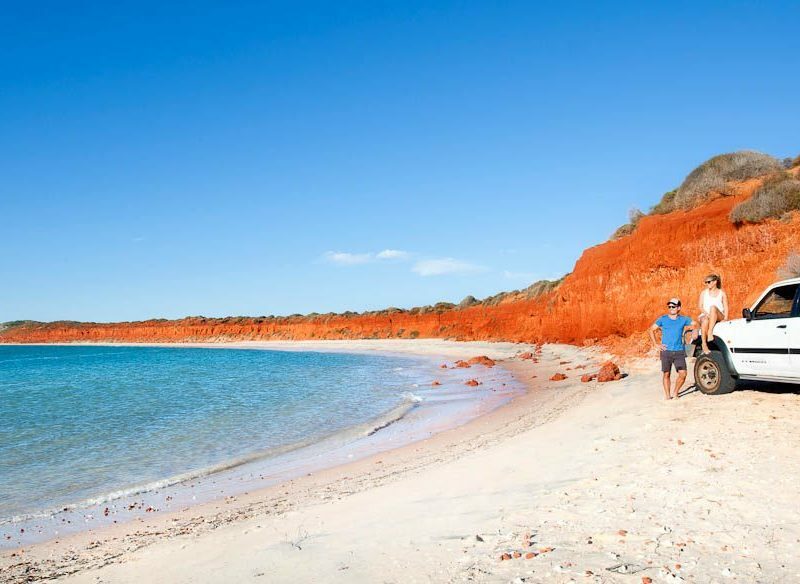 On the edge of Western Australia’ Great Sandy Desert, Broome’s 22-km long Cable Beach is an outback star, where the dramatic seascape of blues and whites bangs headlong into ochre and reds of the interior. Most importantly there is plenty of opportunity for pampering, at the likes of Cable Beach Club and Eco Beach, and desert adventures too. Home to that oh-so bucket list topper: a sunset camel ride along the beach. When you climb out of the helicopter at Kimberley Coastal Camp, onto the blindingly white shell grit beach, you realise you are only one of a handful of people for hundreds of kilometres in any direction along this stretch of Kimberley coastline. Fear not, though, the cuisine is gourmet, the accommodation comfortable, the hospitality warm, the fishing sublime and the nearby Gwion Gwion (Bradshaw) and Wandjina rock art rock art absolutely worth the wander. Another delightfully remote Kimberley ‘bush camp’ – 280km north-west of Kununurra set on a rocky hill surveying the Timor Sea. On approach to Faraway Bay in the North Kimberley (photo: Ewan Bell). The restaurant-quality creations that come from the rustic kitchen will surprise, think impossibly fresh red snapper, with accompaniments like watermelon, mint and feta salad and crunchy spanakopita. Stare out into the bay for some dugong and croc spotting or organise a boat to explore the dramatically rising coastline. See Faraway Bay. You won’t find this eco wilderness retreat by accident, and the reality is that only a privileged few will ever make it to the isolated retreats like this in Arnhem Land. The hour’s small boat trip to Bremer Island from the mainland sets you up in an intimate retreat at one with the elements; solar and wind power, and rain water, powering your whims. The lodge, around an hour by air from Darwin, is a patch of luxury in the true wilderness of the Garig Gunak Barlu National Park, engulfed by sandy beaches, dunes, grasslands, mangroves, lagoons, coral reefs and abundant marine life. The very comfortable lodge, offering award-winningly fresh cuisine, is a tasty example of how to build a “resort” without destroying the landscape. See Seven Spirit Bay. The Tiwis, 100km directly north of Darwin, offer the visitor a comparatively accessible glimpse at not only sublimely contrasting bush and ocean, but also an authentic mosaic of Indigenous culture, powered by an energetic arts and crafts community. Melville Island Lodge, great for barramundi fishing, and Bathurst Island Lodge offer solid creature comforts on the “the islands of smiles”. For those making a Cape York crusade, a grand place to rest your weary head is at Elim Beach. Aboriginal elder Eddie Deemal runs a campsite with masterful views of Cape Bedford, a popular weekender for Hope Vale locals. Jump in your 4WD for a look at the nearby ‘coloured sands’, said to be “reflections of the rainbow”. For more information see Tourism Cape York. 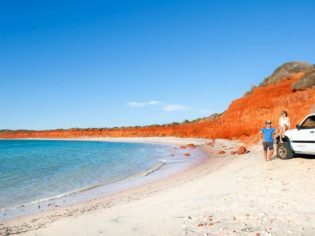 Just north of WA’s Denham, and adjacent to Shark Bay Marine Park, this underrated national park is replete with opportunities to see striking rust-red sand dunes give way to alabaster white beaches and a crystal aqua ocean. For the adventurous, a chance to explore 52,500 hectares of shrublands and rolling sandplains. Monkey Mia is on the park’s cusp, if you want to an up-close-and-personal dolphin experience thrown in. For more information see Western Australia. South Australia’s Port Augusta, gateway to the Flinders Ranges, is on the cusp of the outback and “the crossroads of Australia” – and only just over three hours from Adelaide. See myriad coastal treasures from the trails and waterways of the top of the Spencer Gulf by hiring a kayak. For more information see South Australia. The bay, near to Cape York’s Heathlands Reserve, is another must stop on a trip to The Tip. The large white sand dunes dominate the vast area which encompasses much of the environmentally significant Jardine River catchment area.